”I don’t think the history and tradition should ever be forgotten and it certainly should never be seen as a problem or an excuse for how we’re doing now. Showing that this club has enjoyed success in the past provides a target for everyone. But there is a generation of fans who are fed up with hearing about the European Cup victories from my time. I would really like this generation to share the times that the previous ones have done, as they did when they got a bit of glory in 2005. So said Kenny Dalglish on his return to Liverpool in January 2011. The Scot is not known as one of the most eloquent men in football, but these words were powerful and struck a chord. Twenty years from now will there be Wigan Athletic fans who are fed up of hearing about winning the FA Cup and the glories of wins over the elite clubs of English football? Will past successes provide a target or will they be a millstone around the club’s neck? League 1 beckons Wigan after ten years away in the upper echelons. This time around it feels like a step into the unknown. The deconstruction of the playing staff that started in January will be completed over the coming weeks. The club has to cut its coat according to its cloth, from a £50 million salary bill in the Premier League in 2012-13 to one nearer £10 million in 2015-16. Players come and they go. That is the nature of football. But Emmerson Boyce’s departure is much deeper than that. For me his presence on the field was always a reminder of the teams of the Martinez era, who achieved what was beyond our wildest dreams. Boyce and Wigan Athletic seemed to go hand in hand, the player and the club making constant, steady progress, jointly punching above their weight. Boyce was signed by Paul Jewell from Crystal Palace in August 2006 as a replacement for right back, Pascal Chimbonda. He quickly established himself as a solid and reliable defender, playing either at right back or in the centre of defence. Boyce was to make 34 league starts in that 2006-07 season. However, Mario Melchiot was signed in the summer of 2007 and became the first choice right back, with Boyce being used primarily in the centre of defence. He made 25 league starts in that 2007-08 season. The following season saw him make 26 starts. But it was the arrival of Roberto Martinez in the summer of 2009 that was to change Boyce’s career. Distribution had not been Boyce’s strong point, but under the influence of the Catalan, it started to improve. Boyce was to experience true highs and lows during the four years with Martinez. In September 2009, with Latics playing a new brand of football, Boyce lined up at centre back with Titus Bramble, in Wigan’s first ever league victory over Chelsea, a 3-1 win. A couple of months later that same central defensive partnership had a torrid time at Tottenham, resulting in a 9-1 defeat with Jermain Defoe scoring five goals. Gary Caldwell was to be signed in January, with Boyce losing a regular place in the lineup. However, Boyce did play in the last match of the season when Latics were thumped 8-0 by Chelsea. He had made 23 league appearances. Boyce was back in the starting lineup in the 2010-11 season, but missed some 10 weeks due to injury. He went on to make 22 league appearances, including the final game of the season at Stoke when he made a goal line clearance in the first half before Hugo Rodallega’s header guaranteed safety from relegation. Latics started the 2012-13 season badly and suffered seven consecutive losses in September and October. Following a 3-1 defeat by Wolves on November 6th, Martinez decided to change the system of play. For the next match with Blackburn he brought in a back line of three central defenders – Steve Gohouri, Gary Caldwell and Maynor Figueroa – with Ronnie Stam and David Jones as wing backs. Gradually results started to improve as the players adapted to the new system. Boyce’s first game in the new system was as a wing back in a 3-1 defeat at QPR at the end of January. He moved into the back three for the next couple of matches, a 3-0 defeat at Tottenham and a 1-1 home draw with Everton. Martinez then opted for the safety of Boyce at wing back, rather than the defensively- suspect Ronnie Stam. Boyce was to get a better feel for the position, which was more physically challenging for him. The tide was to turn in mid-March as the players started to play really well in the system. Shaun Maloney had established himself as a starter, with Boyce and the January arrival, Jean Beausejour, playing key roles as wing backs. Boyce’s form was a revelation. He had been transformed into a high quality wing back, defensively solid as always, but making long runs off the ball to make himself available to receive passes. But more than anything else it was the quality of his passing that caught the eye for me. Could this be the same player we saw in the Jewell era? He will be long remembered for his classy performances in the epic wins at home over Manchester United and away at Liverpool and Arsenal. The following season was Latics’ last in the Premier League, but Boyce was to play a key role in helping lift the FA Cup. He had played at wing back in the 3-0 win at Everton and the 2-0 victory in the semi final against Millwall. But for the final he was drafted into the back three, together with Antolin Alcaraz and Paul Scharner. Being captain of a side that won the FA Cup is something he will never forget. Boyce was clearly a late developer who had gained the self-confidence to play football in the Martinez style. The arrival of Owen Coyle meant a return to a flat back four, but Boyce did get opportunities to play in the wing back position on the occasions when Uwe Rosler chose to play with three central defenders. In the absence of Gary Caldwell through injury, Boyce had become the regular captain and an automatic choice in the team. He was to play a remarkable 50 matches in that 2013-14 season. In August he had been back once again back at Wembley, leading his team out in the Community Shield against Manchester United. In September he led them out in the club’s first ever European competition match in Bruges. In early March he was to captain them to another famous FA Cup win over Manchester City, a 2-1 win in the sixth round at the Etihad Stadium. A month later he was back at Wembley for the 1-1 draw in the semi final against Arsenal. His season finished with two close encounters with QPR in the Championship playoffs. Sadly Boyce could not maintain the same kind of form in the 2014-15 season that followed. He was not alone in that respect – it would not be an exaggeration to say that not one single player in the squad played to his potential. However, at times it looked like the years had caught up with him and at 35 he had lost some of his previously considerable pace. January saw a clear out of 13 players including his fellow cup final winners Roger Espinoza, Shaun Maloney, Callum McManaman and Ben Watson. Just like with Liverpool an era of success had ended and the club was adjusting to a new reality. Dave Whelan had backed Uwe Rosler in the transfer market in a bid to get back to the Premier League, but it was to backfire with the German losing his job in November. Boyce was to work under his seventh manager in his ninth year at the club. Malky Mackay was brought in by Whelan to get Latics back into the promotion race, but the reverse happened. Boyce no longer commanded a regular starting berth in the team and by the end of January, having seen the vestiges of the Martinez legacy depart, the writing was surely on the wall for him. The club was seriously downsizing just in case the unthinkable happened and Latics were to find themselves in League 1 next season. To not do so could jeopardise its financial future. Moreover so many players had not been playing to their potential, just not appearing to show the commitment on the field that fans expected. Sadly the downsizing left the squad short on quality and Mackay just could not turn things around. 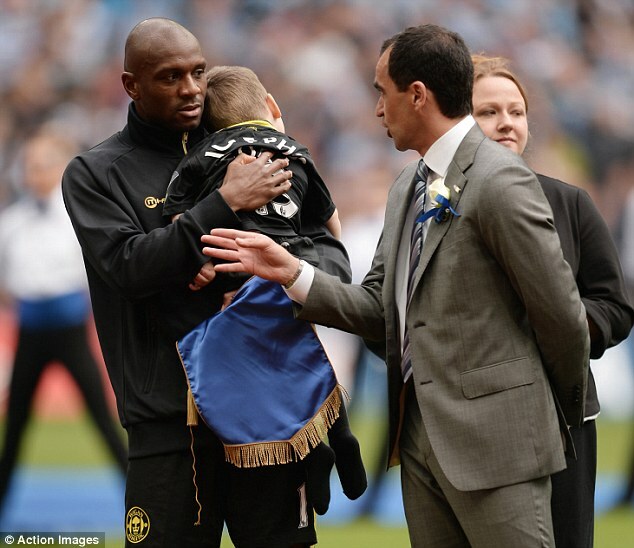 After nine years Emmerson Boyce had become the epitome of what the club’s successful era was all about. In parallel he and the club had punched above their weight, competing on a field that was not level, against the elite of English football. His resilience and willingness to improve professionally made him a role model for his colleagues. Off the field he was a great ambassador for the club and his work with Street Soccer USA and Joseph’s Goal was notable. As Wigan Athletic supporters we will all have our favourite and most memorable Boyce moments. I can remember being behind Mark Schwarzer’s goal at Fulham, with Latics fans singing ‘I’m a Believer’ at the tops of their voices, when he hit an absolute gem of a shot into the corner of the big keeper’s net. His block of what appeared to be a certain goal by Edin Dzeko in that sixth round cup win was unbelievable and will compete with any such incidents in world football. The post-match celebrations at Wembley and Boyce holding the FA Cup with Gary Caldwell beggared belief. But my favourite was when he carried Joseph Kendrick on to the pitch at Wembley. It was an unforgettable moment in a sport that can be as cynical as any. This is what David Sharpe, Gary Caldwell and other senior managers at the club are currently dealing with. The club has to downsize to a wage bill around a third of what it was in that first season back in the Championship. Sharpe and Caldwell have provided a breath of fresh air to a club that was meandering with a lack of leadership and direction. They have a hard road ahead of them, but the support of the majority of the fans. The waters are going to be choppy over the next couple of months as things are reengineered. There have been fans who have advocated finding a place for Emmerson Boyce, not only as a player, but also as a coach or an ambassador for the club. However, in the current economic climate that the club was facing, adding additional backroom or administrative staff was unlikely to happen. Sadly the club will most likely have to downsize its non-playing staff too, cutting back towards bare bones. This is something that Sharpe, Caldwell and company will surely work on. Over the past couple of years too many players have been frozen out, with seemingly no future at the club, but still on the books. Others have come in and found it hard to settle and play to their potential. There are so many supporters who are sad to see Emmerson Boyce not continue to be on the club’s playing staff. Some would say that he should have been offered a contract extension for another year on a salary commensurate with League 1 status. Others would opine that Boyce will be 36 in September, his best days behind him. Better to invest the more limited finances in younger players for the future. Both views have credence. However, the way in which Boyce has been treated appears to reflect those broader human resource management issues within the club. Some fans were disappointed with Boyce in that he had talked with the media about how he felt about the contract offer. Moreover his wife was active on the subject on Twitter. Why would a player who has appeared such a role model behave in that way? Some even said that he was using the media to put pressure on the club to give him a better offer. After all what right did he have to complain after picking up £1 million-plus salaries from the club over the years? Others sided with the player. There had to be something seriously wrong with the scale of the offer he received. Why was the club offering its most highly respected player and captain a deal on youth equivalent terms? What happened with the communication? The anguished exit of Emmerson Boyce leaves a sour taste in the mouth. However, life goes on at the club and fans will continue to support the youthful duo of Sharpe and Caldwell. They have a difficult job to do to turn things around, but they remain optimistic about the road ahead. Let’s hope they can learn from past mistakes made by the club and make sure they do not recur. Emmerson gave his all right to the last game, and he will always be a legend at the DW.